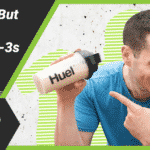 Home » Huel Review – A Vegan Meal Replacement High in Omega-3? 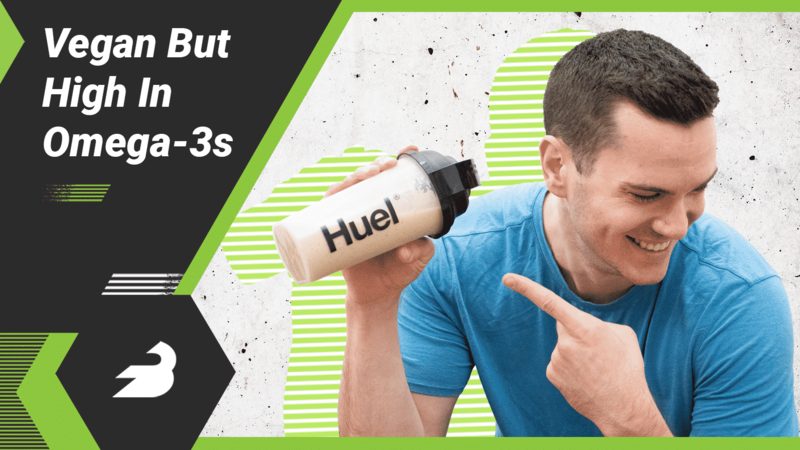 Huel Review – A Vegan Meal Replacement High in Omega-3? 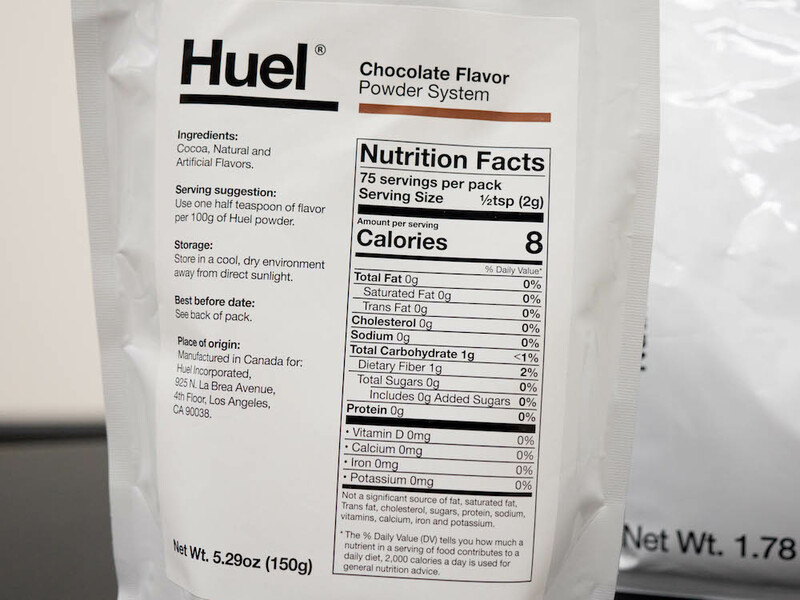 Huel is a British company that produces a meal replacement product that was formulated by nutritionist James Collier. The goal: to come up with a supplement that contains 100 percent of the daily nutrients stipulated by the European Food Safety Authority. The company has sold over 17 million meals since they launched and today they have a few different products: the regular Huel, which is available in Vanilla and unflavored; a gluten-free Huel; flavor boosters to improve the taste; and in the UK they also sell Huel bars and a few other goodies. 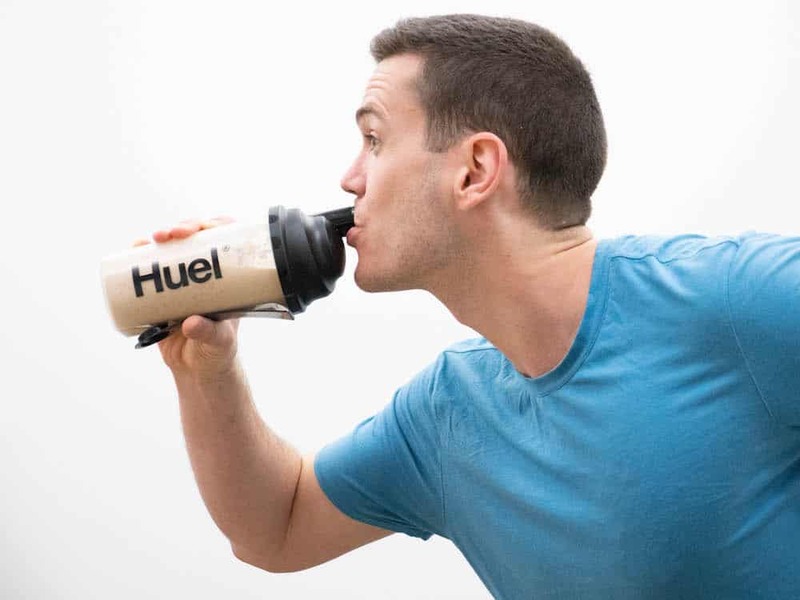 Huel is a portmanteau of “human” and “fuel” and that’s the goal, here: all your vitamins, all your minerals, all your macronutrients, even all your omega-3 fatty acids. We picked up the Vanilla flavor to see how it holds up, along with the chocolate flavor boost. This meal replacement aims to deliver a shake with quality protein and fiber from real foods with minimal sugar. One serving is three scoops, which equates to one cup of powder. That serving has 500 calories: 37 grams of protein, 47 grams of carbohydrates (9 grams of fiber, 1 gram of sugar), and 16 grams of fat (3 grams of saturated fat, no cholesterol). When it comes to the vitamins and minerals, I was super impressed by the spread. If you include sodium there are 28 vitamins and minerals here, providing everything from Vitamin A to zinc, plus a lot of nutrients that are often left off of meal replacement shakes like Vitamin K, chromium, choline, and chloride. In one serving you’ll get 25 percent of most of the nutrients, with some coming in higher: there’s 40% of your magnesium, 70% of your selenium, 80% of your Vitamin C, and a few others get higher dosing as well. 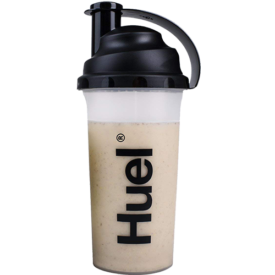 Huel topped our list of the best meal replacements on Earth! Don’t miss the other entries. Unlike a lot of competitors, there’s also information about Omega-3 fatty acids: there are 3.6 grams per serving, along with 4.1 grams of Omega-6 and 1.4 grams of medium chain triglycerides. Besides the lengthy vitamin and mineral blend, the ingredients here are pretty simple: oats, pea protein, flaxseed, brown rice protein, medium chain triglycerides (from coconut), sunflower oil powder, artificial vanilla flavoring, stevia, sucralose (an artificial sweetener also called Splenda®) and three kinds of gum: xanthan, acacia, and guar. It’s worth pointing out that all these ingredients are vegan. Remember that this product is also available in unflavored and gluten free versions. First of all, I loved the macros. 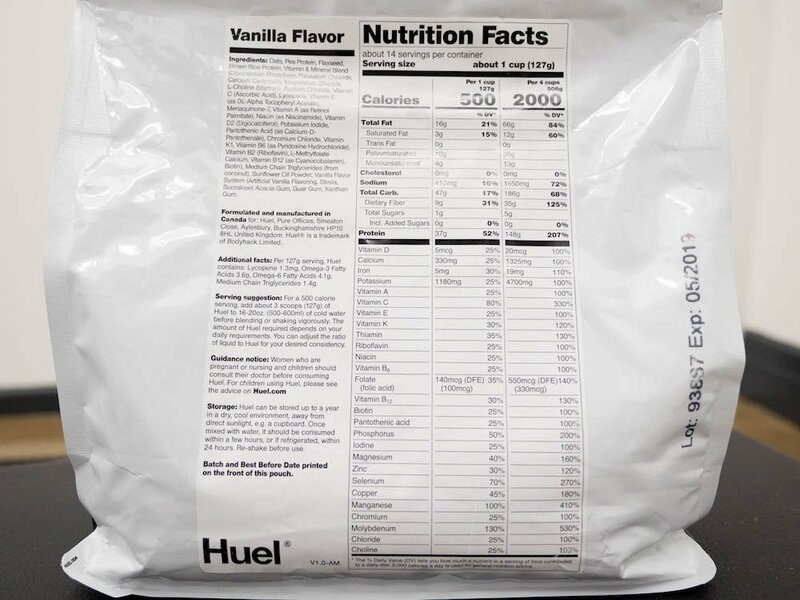 A lot of meal replacements are basically nutritious, low fat protein shakes with just one or two hundred calories per serving, but Huel gives you the option of a hefty, 500-calorie serving with a ton of protein and plenty of fat, plus it’s easy to split it into smaller snack-sized portions because one serving is three scoops. I also like that it’s not high carb or low carb. You’re looking at 37 grams of protein and 47 grams of carbs (38 grams of net carbs if you take away the fiber) — that’s a macro split I’m happy to take on workout days or on rest days. The nutrition, of course, is fantastic. There are a ton of nutrients here that I’ve already mentioned, but where this product really shines is the Omega-3 fatty acids. This is a vegan product and the Omega-3s come from ALA, a plant-based Omega-3 that the body actually has to convert to EPA and DHA, the kinds of Omega-3s that are usually found in fish and other animals. ALA is often criticized as a source of Omega-3s because some studies suggest you lose up to 90 percent of it as the body processes it to EPA and DHA. But the great thing about Huel is that it contains 3.1 grams of ALA per serving and while there’s no recommended daily intake of Omega-3s, many experts suggest 250 to 500 milligrams. That means that even if you do lose 90 percent of it, you’re still getting about a day’s worth of the stuff. That was a great touch. Note also that there are 4.1 grams of Omega-6 here as well. A healthy ratio of Omega-3 to Omega-6 is considered something like 1:3, while the average person eats closer to 1:20. So the ratio was great here as well. The main complaints I can see some people having with this product is that it has artificial flavors and sweeteners and among certain people, gums can cause digestive distress. But that’s a very small portion of the population. The purchasing process is a little frustrating. Right now you usually have to order two big, 3.9-pound bags at a time, so you kind of have to go all in. Those two bags cost $66 and provide 28 servings all together. That’s $2.35 per serving, which is very inexpensive. 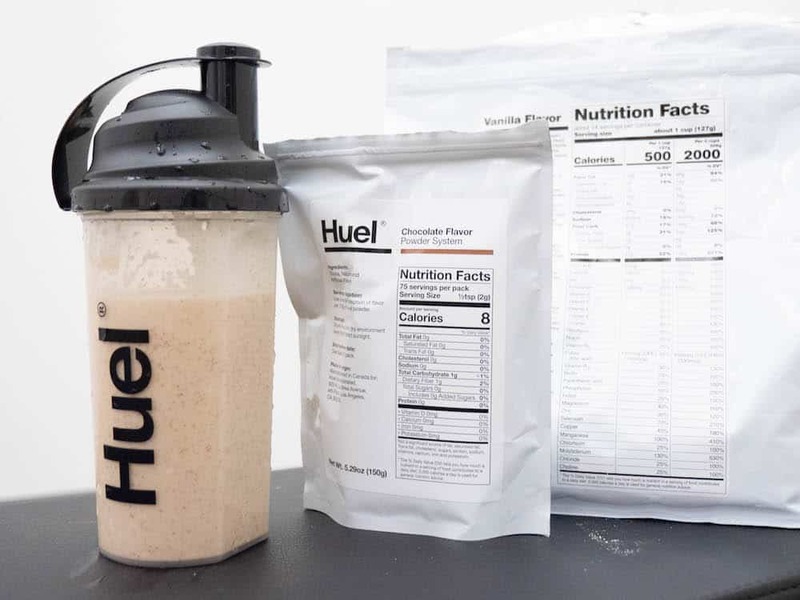 The average cost of a meal replacement is about $2 to $2.50 per serving, but note that the average meal replacement has well under half the calories of one serving of Huel and is seldom as nutritious. I grabbed the Vanilla flavor and while it smells like Graham crackers, the flavor is closer to your average vanilla vegan protein shake, which is to say nuts and vanilla. It’s not as strong as most vegan shake though, so I found the nuttiness pretty smooth and enjoyable. I also tried out the Chocolate Flavor Boost, which costs $9 for 75 servings. One serving is very small (half a teaspoon for a little over two scoops of Huel) and I found it didn’t make it particularly chocolatey, rather it produced a more cookie like flavor — that Graham cracker flavor came right on back. Note that the flavor boost is indeed meant to be used with Vanilla, but it can be added to Unflavored as well. It contains just cocoa and natural and artificial flavors. You can also pick up Strawberry, Canana, Cappuccino, and Chocolate Mint flavors. I was really impressed by Huel. This is the first meal replacement I’ve seen that offers this much nutrition and also does such a great job with Omega-3 fatty acids — plus it tastes pretty decent. If you don’t like artificial flavors and sweeteners you might not love it, but otherwise there’s very little to complain about here. does the unflavored also contain artificial flavors and sweeteners? Just made my first order today, hope to use it to stop me making crappy lunch choices while working and as an evening snack (not a full 3 scoops) again to stop me reaching for chocolate and cookies.